The accommodation incorporates the use of natural wood to great effect and briefly comprises; imposing conservatory entrance, fitted kitchen with handmade Cherry Wood units, snug/dining room, large lounge, front entrance vestibule, basement with study/bedroom 4, utility room, wc and shower, 4 bedrooms (one with en suite wc) and bathroom. Substantial Swiss style outbuilding providing quadruple garage with adjoining workshop and a large room over suitable for hobbies room/play room/home office with potential for conversion to self contained guest accommodation (subject to any necessary local authority consents). Beautifully landscaped gardens enjoying complete privacy with large garden shed and greenhouse. Gas fired central heating. The property occupies a charming position in the peaceful, unspoilt small hamlet of Wrentnall, which is approximately 7 miles south of Shrewsbury and close to the south Shropshire hills, which form an area of outstanding natural beauty and provide wonderful opportunities for recreational pursuits. There is a primary school and village shop and village pub in the nearby village of Longden. A truly individual, comfortable, 4 bedroom detached family home of character and charm, situated in a peaceful and unspoilt small hamlet, approximately 7 miles south of Shrewsbury. Attractive Fitted Kitchen - 3.58m x 3.58m (11'9" x 11'9") - Oak strip floor, comprehensive range of handmade painted kitchen units comprising granite topped twin bowl stainless steel sink unit with mixer taps, cupboards beneath, integral dishwasher, further base units with Sycamore wood topped work surfaces, cupboards and drawers, range of eye level cupboards. Rangemaster cooking range incorporating 5 gas rings, griddle, grill, slow cooker and two fan ovens with stainless steel canopy above incorporating extractor fan, further range of corner cupboards incorporating recess for microwave, 2 windows. Recessed fireplace with cast iron and Clearview log burning stove set on a slate hearth with an oak surround and mantel. 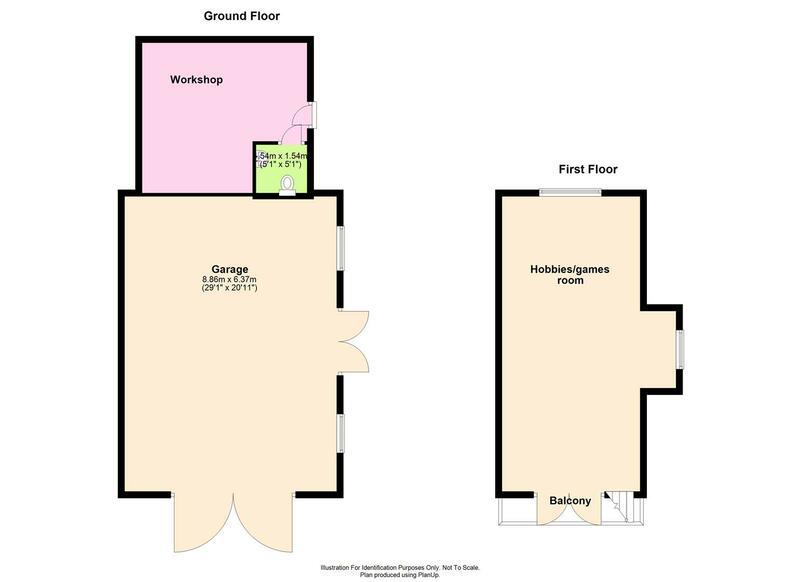 Utility Room - 3.51m x 3.20m (11'6" x 10'6") - Quarry tiled floor, deep glazed sink set in hardwood worktop with adjoining worktop providing space for washing machine and tumble dryer beneath, exposed beam, side entrance door. Door leading to WC and wash basin. Note: the basement could easily be converted to provide self contained accommodation if desired. Boiler Room with Worcester Bosch mains gas boiler and Sadia Megaflow water system. Built in shelves for airing clothes. From the lounge arched panelled double entrance doors provide access to the FRONT ENTRANCE VESTIBULE with a further pair of arced doors leading to the garden. Steps rise from the lounge to an open-plan INNER HALL with an oak STAIRCASE rising to the half landing where the staircase divides into two. The main LANDING has a high ceiling incorporating exposed beams and roof trusses, 2 windows and Velux skylight and Cedar of Lebanon boarded floor. Master Bedroom - 6.07m x 3.86m (19'11" x 12'8") - Cedar of Lebanon boarded floor, vaulted ceiling with exposed beams and timbers, window, 2 Velux skylights. Bedroom 2 - 3.89m x 3.58m (12'9" x 11'9") - Oak boarded floor, exposed beams, 2 windows, attractive range of built-in wardrobes incorporating drawers beneath, fireplace with cast iron grate, wooden surround and mantel (not used). En Suite Wc - WC low type flush, Wash hand basin with tiled surround. Bedroom 3 - 4.09m x 2.97m (13'5" x 9'9") - Cedar of Lebanon boarded floor, exposed beams and roof timbers, window. Bathroom - 2.82m x 2.82m (9'3" x 9'3") - Cedar of Lebanon boarded floor, white suite comprising raised roll top panelled bath, pedestal wash hand basin, wc low type flush, tiled shower cubicle with Mira shower unit, heated towel rail, built-in toiletry cupboard with door incorporating stained glass panels, exposed beams and roof timbers, Velux skylight. Double metal entrance gates provide access to a parking area with an attractive stone set driveway leading down to a gravelled forecourt. Substantial Swiss style outbuilding providing large QUADRUPLE GARAGE AND WORKSHOP SPACE 29'9" (9.07m) x 21'1" (6.43m) Double front entrance doors and arched half glazed side access doors, power supply, fluorescent lighting. 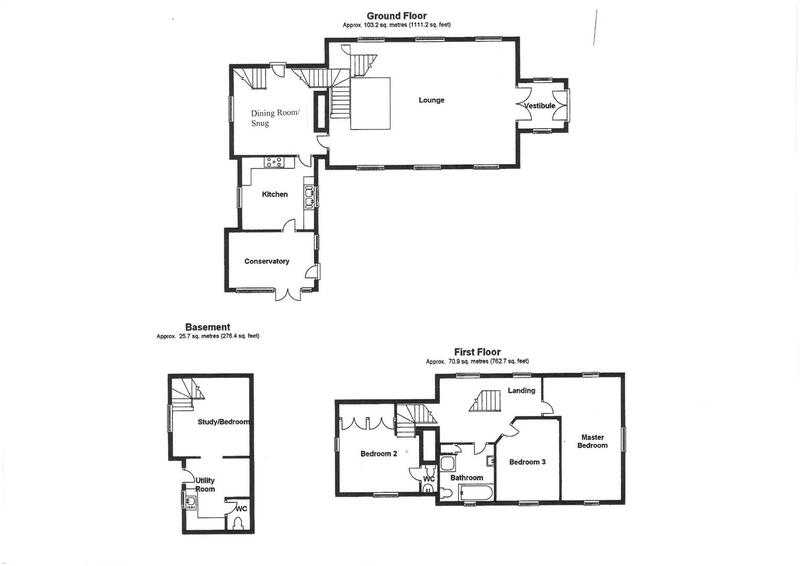 An external staircase leads to a balcony and a LARGE FIRST FLOOR ROOM 28'3" (8.61m) x 14'3" (4.34m) ideal for use as a hobbies room/games room/home office, or has potential for conversion into self-contained guest accommodation, subject to obtaining any necessary local authority consents. Power supply and halogen lighting. ADJOINING WORKSHOP/STORE 15'7" (4.75m) x 14'9" (4.50m) (maximum overall) Power supply, fluorescent lighting, separate wc. Outside cold water tap. Beautifully landscaped gardens complement the house and have been lovingly maintained and enhanced by the present owners with a brick pathway approached through a brick arch from the driveway, leading down between shrub and flower beds to the conservatory entrance. Lawns to either side of the drive are planted with a selection of ornamental trees on one side, whilst around the other lawn there are well stocked flower beds and within the garden, there are wonderful box hedges enclosing further beds and a gravel terrace in front of the house. The gardens continue around to four sides of the residence with a greenhouse in a productive vegetable section containing soft fruit.